You're invited to the biggest birthday celebration of the year! 2019 will be remembered as a milestone in history with a year-long Diamond Diana Celebration, marking the 75th birthday of one of the greatest entertainers of all time, Diana Ross! 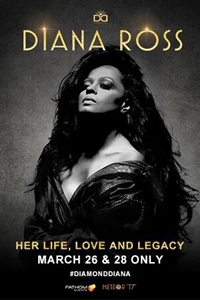 This exclusive cinema event - Diana Ross: Her Life, Love and Legacy will never-before-seen footage, the best of the Diana Ross: Live in Central Park concert and inspired, heartfelt messages from the Ross family delivering a passionate introduction to the presentation capturing the magnitude of the event. True fans and newcomers alike can celebrate with Diana in theatres this March!